We are a farming family, living in Winnsboro, S.C. where we raise beef cows, pastured poultry and pigs. Dad still works an off-the-farm job, and mom homeschools our three wonderful children. We had a 25 acre yard. I always loved the outdoors and was convinced we needed to make better use of the land, most of which was pasture. My great-grandfather farmed this land. My grandfather farmed this land. So I guess farming was just in my blood. I started building fences in February 2011, and by April we moved our first four cows on to about eight acres of fenced pasture. 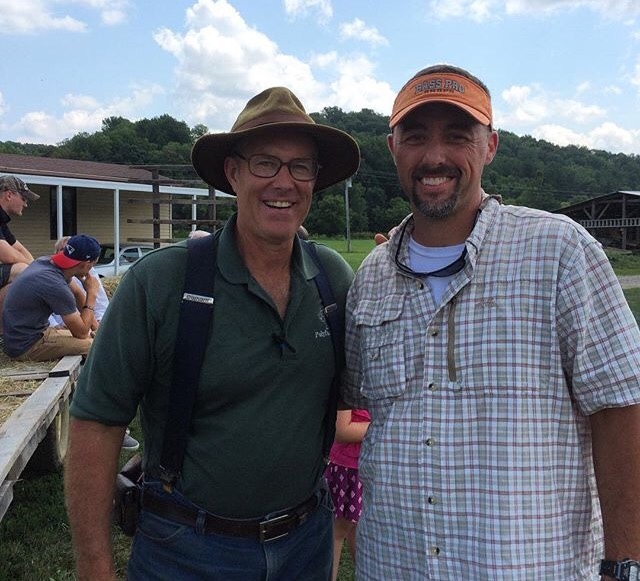 August 24, 2015: the day I got to meet Joel Salatin. That summer, we fenced in about ten acres more. I really didn’t know what I was doing, and I still don’t know much more. I guess I was just crazy enough to try. Come to think of it, that’s the way I am about a lot of things, just try it and let’s see what happens. That year we also added our first flock of laying hens which was about ten birds I think. I raised cows like I saw most folks around me doing. When the calves reached about six months old, I loaded them up, hauled them to the stock yard and they were gone to who knows where. I didn’t care where they were going as long as they mailed me a check by the end of the week, which they always did. 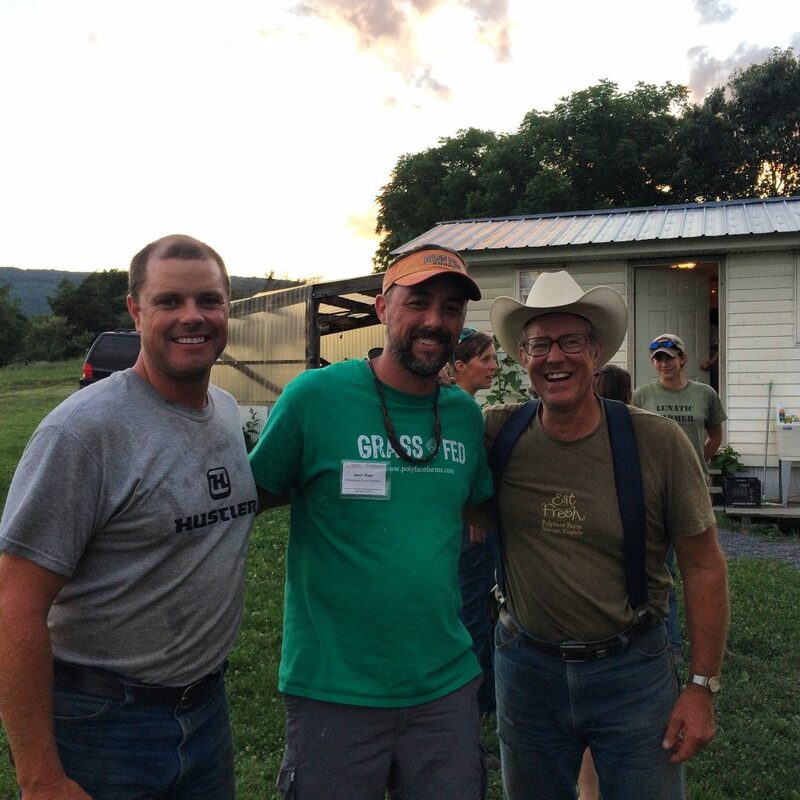 THEN, my pastor’s wife Sarah gave me a book titled “You Can Farm” by someone named Joel Salatin. I had never heard of the guy, so I put it on the coffee table. Well eventually I got around to reading it, and man oh man, what a ride it’s been since then. I have now read all eleven of his books and have visited his farm in Swoope, Virginia (Polyface Farms) twice. I will go back. Thank you Sarah! I look at cows differently now. In fact I look at all animals differently now. I also look at our food system differently, and we have decided to participate in the local food production system. So now we are slowly but surely, implementing his farming practices at Triple J. We move animals around to fresh paddocks and everything is grass-based and chemical free. Instead of hauling cows off to the stockyard, we provide quality beef, poultry and pork products directly to the customer through our farm store that is open Saturdays from 10:00 – 2:00. I have not made the leap into full-time farming yet, so I still work off the farm during the week. My desire is to get there one day, but right now, we are focused on raising animals in a way that respects the animal. Did I mention we are also raising and homeschooling three children on this farm? My hope is, that by creating a family-friendly farm and trying to involve them in everything, maybe one of them will catch the desire to farm this way too. If not, that’s ok, but at least they will have the opportunity. Anyway, God designed cows to eat grass, and that’s just what they eat on our farm. I guess we are really grass farmers. We still have a long way to go, but we are on the way and enjoying every minute of it!